I am running the latest version of motion 3.2.9 on Linux Ubuntu, and I am trying to view video from my PVR 500 Card. When I try to use motion to get pictures out of this device the pictures come out messed up, also if I try to access the card using any other program to view video it also comes wrong. 1 - I test the video from my PVR Card (before running motion) using a VLC player and it works fine. 2 - Run motion to try extract images from this same card, and even though motion seems to load and works without errors, it shows messed up images. 3 - After I close motion and try to play from the device as in (1) the images come up messed up just like they did in motion. 4 - remove and reload my drive and everything is back to normal until I run motion again. Size of image: 720 x 576 x 3/2 = 622080. 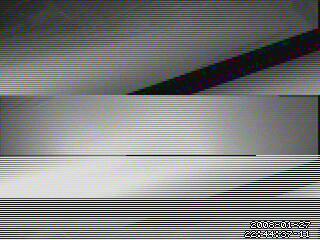 Started ffmpeg stream with image size of 622080 and motionsize 414720.
motion-3.2.9 released + latest PVR patch ? Before without patch motion would simply fail to start when accesing the PVR card. After the patch was applied I was able to start motion and get an image. The problem now is that all I get is a picture like the attachement. The odd thing is that after I close motion if I try to play from the PVR using a player like VLC I get the same image I get from motion. The only way to reset it is to reload my driver. I'll update PVR patch to work with motion-3.2.9 though. PVR patch won't be supported unless someone with that kind of card will handle the support.